In this era of prevention and health promotion, the health-related behaviors of health care professionals have drawn considerable attention and are a common focus of research. Today's young health care professionals not only serve as providers of care for their patients but also are expected to be a role model the advice they impart. However it seems that youths have failed to realize the importance of maintaining good health. Unfortunately, there is increase indulgence of the adverse habits among the youths. Two most common habits which are prevailing in youths are tobacco and alcohol consumption. Medical and dental students represent the young population of the society and carrier wise they are extremely responsible. Medical and Dental students are generally in the age group of 17-25 years. This is the time when lifestyle patterns, both healthy and unhealthy, are consolidated. Moreover, as future doctors, they are the role models for the laity in regard to adverse habits. Tobacco and alcohol are intimately related to health. Use of these substances among future health care personnel is an important issue. The dental team can play an effective role in the creation of tobacco-free patients as well as their communities through participation in community and political action and by counseling their patients to quit. ,,, Maintaining a smoke-free environment is important. Although much published research has been concerned with how to motivate the patient, little attention has been given to the context of when and how dental students undergo attitudinal and behavioral changes with respect to their own smoking habits and alcohol consumption. The rates of tobacco and alcohol use among students are disturbing, and they suggest novel approaches are needed to augment existing prevention programs to reduce the prevalence of tobacco and alcohol use among young people. ,,, They are the future exemplars, more effective measures are required to help students to reduce tobacco. Students claimed that they had no knowledge on the diagnostics and treatment of tobacco dependence or their knowledge on this issue was poor or very poor hence knowledge regarding alcohol and smoking needed worldwide. , Against this background, the present study was carried out, to find out the prevalence and determinants of tobacco and alcohol use among dental and medical students studying in Davangere city. A cross-sectional questionnaire survey was conducted among male first, final year and house surgeons of J.J.M Medical College and Bapuji Dental College, Davangere. The questionnaire consisted of 20 close-ended questions relating to the use of tobacco and alcohol. Official permission was taken from the concerned authorities to conduct the survey. Students belonging to dental and medical colleges were interviewed separately. The inclusion criteria were those students who volunteered to participate in the study. Depending on the free schedule 1 st year students were asked to gather in the lecture hall of respective colleges. For a final year and interns, questionnaire was distributed in clinics of various departments where they were posted. Subjects were ensured that all the data obtained were maintained confidentially. A total of 400 questionnaires was distributed among the students of the 1 st year, final year and house surgeons of both faculty and the response rate was 100%. The completed questionnaire was seen exclusively by the investigator. The questionnaire was pretested by conducting a pilot study with five students from each year. After analyzing the pretest data, Cronbach's alpha correlation coefficient α = 0.846 indicating the survey had a high degree of internal consistency. To see the reproducibility translation of the questionnaire was done to the native language Kannada and after retranslation to English reproducibity was same. The data so obtained were compiled and subjected to statistical analysis. the raw data were compiled, tabulated and statistically analyzed using SPSS version 14 (SPSS Inc. 2008 by IBM). Chi-square test and Pearson correlation coefficient test were applied for assessing significance difference between the students of two colleges and year in which they were studying for usage of tobacco and alcohol. The number of respondents participated in the study were 170 male dental students and 230 male medical students. Among 170 dental students, 25 students were from the 1 st year, 76 students were from final year and 69 house surgeons and among 230 medical students 66 were from 1 st year and 84 were from final year and 80 house surgeons participated in the present study [Table 1]. Percentage of tobacco consumption was 4 (16%) among 1 st year dental students and 17 (25.75%) among 1 st year medical students, and it was not significant. Percentage of tobacco consumption was 44 (57.80%) among final year dental students and 46 (54.76%) among final year medical students, and it was not significant. Percentage of tobacco consumption was 45 (65.20%) among dental house surgeons and 38 (47.50%) among medical house surgeons, and it was significant [Table 2]. Percentage of alcohol consumption was 5 (20%) among 1 st year dental students and 15 (22.72%) among 1 st year medical students, and it was not significant. Percentage of alcohol consumption was 43 (56.57%) among final year dental students and 43 (51.19%) among final year medical students, and it was not significant. Percentage of alcohol consumption was 41 (59.42%) among dental house surgeons and 36 (45%) among medical house surgeons, and it was not significant [Table 3]. Among 93 dental undergraduate students and 101 medical undergraduate students, 48% dental undergraduate students and 41% medical undergraduate students attributed reason as peer pressure. 28% of dental undergraduate students and 35% medical undergraduate students told consumption was due to depressive mood. 72% dental undergraduate students and 87% medical undergraduate students told tobacco consumption was during examination preparation. 60% dental undergraduate students and 75% medical undergraduate students told tobacco consumption was due to workload [Graph 1]. Among 89 dental undergraduate students and 94 medical undergraduate students, 23% dental undergraduate students and 19% medical undergraduate students attributed the reason for alcohol consumption as socialization. Thirty-one percent of dental undergraduate students and 36% medical undergraduate students told consumption was due to the feeling of grown up. 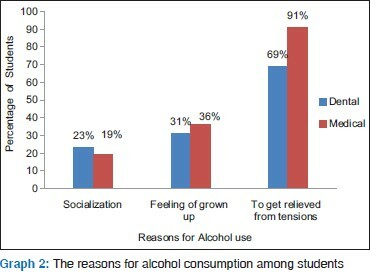 Sixty-nine percent dental undergraduate students and 91% medical undergraduate students told alcohol consumption was to get relieved from tensions [Graph 2]. Dental and medical undergraduate students opinion about how to quit these habits. Among them, 84% dental undergraduate students and 94% medical undergraduate students told will power. Sixteen percent of dental undergraduate students and 15% medical undergraduate students told family intervention will make them to quit these habits. 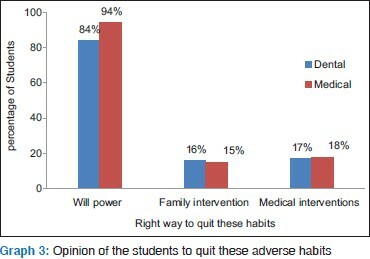 Seventeen percent dental undergraduate students and 18% medical undergraduate students told medical intervention can help to quit these adverse habits [Graph 3]. This study showed that a greater proportion of dental house surgeons smoke and consume alcohol compared with medical house surgeons. The prevalence of smoking among 1 st year was more among medical students and in relation to alcohol consumption was same among both. The reasons attributed for increased smoking was exam preparation followed by workload and reasons for alcohol consumption was to get relieved from tensions. Dumitrescu in 2006 at Romania conducted a study on Tobacco and Alcohol use among dental and medical students. , Prevalence of smoking was 28.84% in 1 st year students and 53.18% in 6 th year dental students, whereas in the present study it was 25.75% among 1 st year students and 54.76% among final year dental students. In their study, prevalence of alcohol was 39.58% in 1 st year students and 36.36% in 6 th year medical students, whereas our study reported a prevalence of 22.72% among 1 st year students and 51.19% among final year medical students. Tobacco control intervention takes two forms; preventing individuals from starting to smoke or use other tobacco products, and helping current users to stop. Tobacco control and prevention cannot be undertaken without involvement of health care professionals. Physicians and dentists need to be trained to assist to tobacco users to cease smoking. Approaches to tobacco control must be integrated not only into the dental and medical curriculum but also in continuing education programmes (Balczewska, 2004). This study results cannot be completely generalized as the 2 nd and 3 rd year students did not participate in the study. The medical and dental college's environment in this study may not be representative of other colleges due to variations in the factors such as the educational setting, the nature of the training program, and geographic location. Hence, generalization to our country is not possible. Peer pressure although was the recognized determinant influencing tobacco habit, it was not a primary determinant. Creating a conducive atmosphere to prevent these habits should be the concern of college authorities, teachers, and the students. Mangus RS, Hawkins CE, Miller MJ. Tobacco and alcohol use among 1996 medical school graduates. JAMA 1998;280:1192-3, 1195. Bánóczy J, Squier C. Smoking and disease. Eur J Dent Educ 2004;8 Suppl 4:7-10. Aquilino ML, Lowe JB. Approaches to tobacco control: The evidence base. Eur J Dent Educ 2004;8 Suppl 4:11-7. Kavcová E, Kocan I, Squier C. Tobacco control and the role of the medical community in the Slovak Republic. Eur J Dent Educ 2004;8 Suppl 4:46-50. Johnson NW. The role of the dental team in tobacco cessation. Eur J Dent Educ 2004;8 Suppl 4:18-24. Shelley D, Cantrell J, Faulkner D, Haviland L, Healton C, Messeri P. Physician and dentist tobacco use counseling and adolescent smoking behavior: Results from the 2000 National Youth Tobacco Survey. Pediatrics 2005;115:719-25. Watt RG, McGlone P, Dykes J, Smith M. Barriers limiting dentists' active involvement in smoking cessation. Oral Health Prev Dent 2004;2:95-102. 9. Hovell M, Roussos S, Hill L, Johnson NW, Squier C, Gyenes M. Engineering clinician leadership and success in tobacco control: Recommendations for policy and practice in Hungary and Central Europe. Eur J Dent Educ 2004;8 Suppl 4:51-60. Trinidad DR, Anderson Johnson C. The association between emotional intelligence and early adolescent tobacco and alcohol use. Pers Individ Dif 2002;32:95-10. Dumitrescu AL. Tobacco and alcohol use among Romanian dental and medical students: A cross-sectional questionnaire survey. Oral Health Prev Dent 2007;5:279-84. Dumitrescu AL. Attitudes of Romanian dental students towards tobacco and alcohol. J Contemp Dent Pract 2007;8:64-71. Mammas IN, Bertsias GK, Linardakis M, Tzanakis NE, Labadarios DN, Kafatos AG. Cigarette smoking, alcohol consumption, and serum lipid profile among medical students in Greece. Eur J Public Health 2003;13:278-82. Smith DR, Leggat PA. An international review of tobacco smoking among dental students in 19 countries. Int Dent J 2007;57:452-8. Polychonopoulou A, Gatou T, Athanassouli T. Greek dental students' attitudes toward tobacco control programmes. Int Dent J 2004;54:119-25. Mian O, Kay EJ. A comparison of sensation-seeking between dental and biological science students. Eur J Dent Educ 2003;7:171-6. Goehring C, Bouvier Gallacchi M, Künzi B, Bovier P. Psychosocial and professional characteristics of burnout in Swiss primary care practitioners: A cross-sectional survey. Swiss Med Wkly 2005;135:101-8. Osborne D, Croucher R. Levels of burnout in general dental practitioners in the south-east of England. Br Dent J 1994;177:372-7. Thornton LJ, Stuart-Buttle C, Wyszynski TC, Wilson ER. Physical and psychosocial stress exposures in US dental schools: The need for expanded ergonomics training. Appl Ergon 2004;35:153-7. Pau AK, Croucher R. Emotional intelligence and perceived stress in dental undergraduates. J Dent Educ 2003;67:1023-8. Newbury-Birch D, Lowry RJ, Kamali F. The changing patterns of drinking, illicit drug use, stress, anxiety and depression in dental students in a UK dental school: A longitudinal study. Br Dent J 2002;192:646-9. Singh MC, Singh CZ, Banerjee LC, Basannar SD. Determinants of smoking habit among medical. Med J Armed Forces India 2003;59:209-11. Herity BA, Horgan JM, Bourke GJ, Wilson-Davis K. Tobacco, alcohol and other drug use among medical students. Ir Med J 1977;70:532-9.